If you own a DSLR or a point and shoot with an optical zoom, I’m sure that every once in a while you see a beautiful moon and you think about taking a picture of it, especially when the moon is full and beautiful. There are other times when you spot a news announcement about a Lunar Eclipse and you think about capturing the moment, but do not know how to do it right. Or you want to capture the moon together with a foreground object such as a house or a lone tree, but the picture is not coming out right because the moon is much smaller and looks like a white blob. 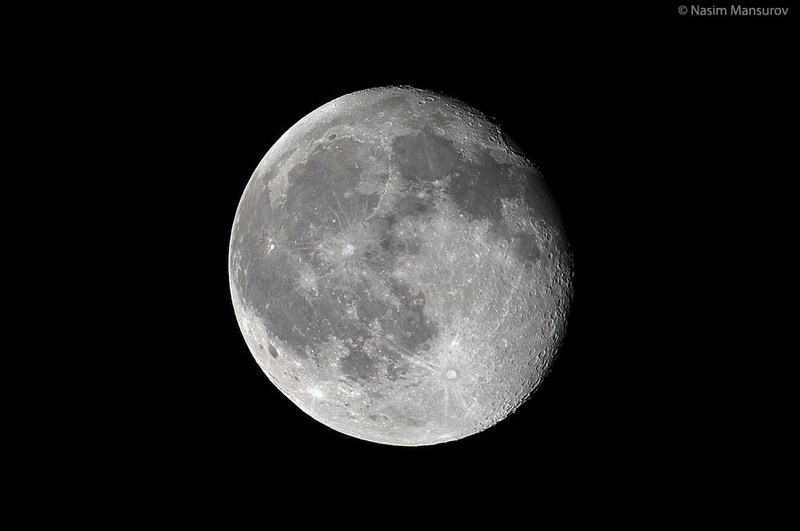 If you had any of these situations or simply want to find out how to take a picture of the moon with a digital camera, then this guide is for you. 1) Why does the moon look smaller in pictures? Before we start talking about how to take a picture of the moon, let’s first answer some basic questions. I’m sure if you have already attempted to take a picture of the moon, you probably ran into a problem where the moon looks tiny in comparison to what you saw while taking the picture. Why does the moon get photographed so much smaller? The simple answer is – you are probably taking a picture of the moon with a wide-angle lens. Keep in mind that your eyes are like a 50mm fixed lens and if you are taking a picture with a wide-angle lens that is shorter than 50mm, the moon will be captured in smaller size! So, if you want to capture an object like a big tree or a house with the moon, you would need to stand further away and photograph the scene at least at 50mm to try to match what you saw with your eyes. 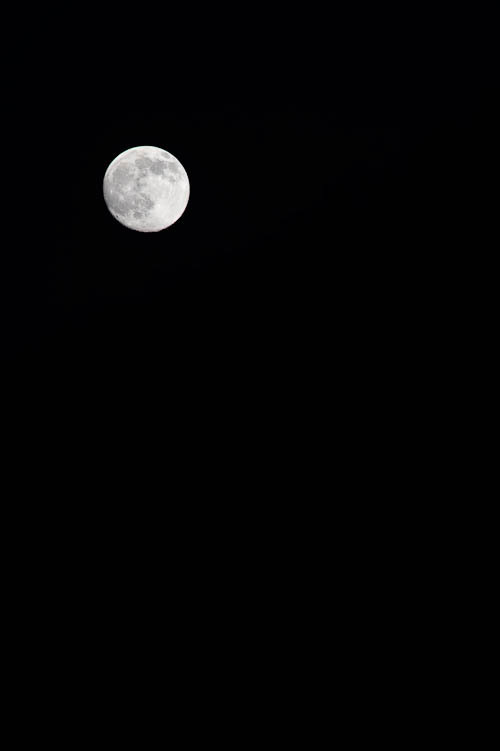 And even at 50mm the moon might look smaller, especially if it was near the horizon when you took a picture of it. This also happens because of a phenomenon called “Moon Illusion“, where the moon appears bigger to your eyes, when in fact it is not. 2) Why do I see the moon as a white blob? If you have taken a picture of the moon after sunset and it looked in the picture like a white circular object rather than the moon, it is because the moon was overexposed. When you take a picture of the moon with other objects around it (as in the example with a tree above), your camera by default will meter, or calculate the exposure, based on everything but the moon. This happens because the moon is too small in comparison with the objects around it and a single spot of light should not affect the overall exposure of the picture. Think of it as a light bulb – if you take a picture of a dimly lit room with a visible light bulb, the room will be exposed normally, while the light bulb will be overexposed. If the camera measured exposure on the light bulb, the room would be completely dark, while the light bulb is properly exposed. The same thing happens with the moon – it works just like the light bulb at night and it will always be overexposed. During the day, however, this is not a problem, because the amount of light coming from the moon would differ only slightly in comparison with the objects around it, including the sky. So, why do our eyes see everything normally, while a digital camera cannot? That’s because our eyes and our brain can see a much broader range of light. In photography terms, this is known as “dynamic range“. Obviously, you should be taking a picture of the moon on a clear night with no clouds in the sky. Even a thin layer of clouds will make it impossible to get a clear picture of the moon, so absolutely make sure that the sky is clear. Pollution in large cities, especially in hot summer days will also play a big role, so I recommend getting out of town and traveling to a remote location with no light or air pollution, preferably at a higher elevation. The less the distance between you and the moon, the better the pictures. In terms of when to photograph the moon, take a look at this US Navy Moon Phases page, where you can find out what phase the moon is currently in and you can also calculate what it will be by picking the date from the bottom of the page. As for the time of the day – any time works, as long as the moon is visible. A DSLR camera with a 200mm+ telephoto lens or a point and shoot camera that has an optical zoom capability. If you want to enlarge the moon and show the details of the moon surface, a good telephoto lens longer than 200mm is almost required. The longer the lens, the better. If you have a telephoto lens that can take teleconverters, I highly recommend adding a teleconverter to increase the overall focal length. For example, a 1.4x teleconverter will increase the focal length of a 300mm lens by 40% or to 420mm total, while a 2.0x teleconverter will increase the focal length of the same lens to 600mm. The only thing to keep in mind, is that teleconverters negatively impact image quality and decrease the maximum aperture of the lens, so if you had a 300mm f/4 lens, it would essentially become a 420mm f/5.6 lens (which is not that big of a deal, because you will be using higher apertures for moon photography anyway). As the focal length is increased, camera shake can also become a big problem. At long focal lengths of 300mm and above, even a slight move can screw up the picture. That’s why if you are using a telephoto lens, a stable tripod is required to be able to produce a sharp image of the moon. Having a remote camera trigger also helps reduce the camera shake and if you have a Mirror Lock Up (MLU) feature in your camera, you can almost completely eliminate all vibrations. The best setup for moon photography is an astro-telescope with a camera mount. Basically, you mount a digital camera to a telescope, which works as a long telephoto lens. But those setups can get very expensive and are suited best for dedicated astrophotography. Camera Mode: Set your camera mode to full Manual Mode. ISO: Set your ISO to 100 if you have a Canon DSLR and to 200 if you have a Nikon DSLR (basically, whatever base ISO you have in your camera). For most other brands, the base ISO is also 100. If you have a point and shoot camera, see if you can find a menu setting to set your ISO to 100. Make sure “Auto ISO” is turned Off. Aperture: Set your aperture to f/11. Shutter Speed: Set your shutter speed to 1/125 on cameras with base ISO 100, and to 1/250 on Nikon DSLRs with base ISO 200. Lens Focus: Set your lens to manual focus (either through a switch on the lens or on the camera) and set your focus to infinity. Be careful while setting the focus to infinity, as some lenses allow focusing beyond infinity. On more advanced DSLRs such as Nikon D300, there is a handy feature called “live-view with contrast detect”, which can accurately acquire focus on distant objects. I have used it many times for my moon photography and it works great! If you do not have such a feature in your camera, then try setting your lens to the center of the infinity sign, then take a picture and see if it came out sharp by zooming in the rear LCD of the camera. Nikon D90 DSLR: ISO 200, Aperture f/11, Shutter Speed 1/250. Canon EOS Rebel XSi: ISO 100, Aperture f/11, Shutter Speed 1/125. The above aperture and shutter speeds are derived from a Sunny f/11 rule, which is not necessarily very accurate for moon photography. I recommend starting with the above settings and adjusting the shutter speed based on the brightness of the moon. If it is too bright, set your shutter speed to a higher value. If it is too dim, set your shutter speed to a lower value. You can also play with aperture, but be careful, as changing the aperture to a small number can actually soften the image, while increasing the aperture to a very high number would mean slower shutter speeds. Remember, the moon moves pretty fast, so you definitely do not want to be photographing it with a slow shutter speed (certainly not below 1/100 of a second), especially when using a long telephoto lens. Another thing I recommend doing is bracketing your shots. When I was taking a picture of the full moon, I noticed that some parts of the moon came out overexposed, while other parts were underexposed. I couldn’t get a perfect shot to properly expose all areas of the moon, so I decided to try taking multiple shots of the moon, then merging them into HDR in Photoshop. To my surprise, the result turned out to be better than expected – the first image in this article was done that way. If you do not want to do an HDR of the moon, I still recommend to bracket the exposures – in worst case scenario, you will keep the best photo and delete the rest. Lastly, for those who have long telephoto lenses longer than 400mm, you might be able to use “Aperture Priority” mode instead of “Manual“, as long as you set your metering to spot metering. At 400mm and above, the moon fills enough of the frame to be able to use modes other than manual. 6) How to take a picture of the moon with a foreground object? The above example is not the best one in terms of subject and composition, but it gets the message across – you will need to combine two exposures to create a single image. The toughest part is to properly mask out the moon and to transparently merge the darker edges of the moon with the blue sky, which should not be a problem if you know how to use the right tools within Photoshop. If the sky is equally dark in both frames, then the amount of time spent in Photoshop is minimal – all you would need to do is copy-paste the moon and you are set! Also, I shot both frames with a 300mm telephoto lens. But what if I had a large object in front of me that I wanted to include in the frame? Obviously, shooting a long telephoto lens wouldn’t work, since the object would not fit in the frame, so I would have to shoot the object with a wide-angle lens and then capture the moon with a telephoto lens, if I wanted the moon to appear larger in the final image. a) Image->Adjustment->Curves and selected “Medium Contrast” Preset from the drop-down menu and clicked “OK”. b) Filter->Sharpen->Unsharp Mask and added 150% in “Amount” field, while keeping the “Radius” on 1.0 pixels and “Threshold” on 0 levels. Very simple and very quick! Once you have a couple of really nice pictures of the moon, why not reuse them for your other night photographs? You could make it whatever size you want (from small to large), you could get even more creative by adding clouds in Photoshop or changing the color of the moon to match your photo – basically, whatever you feel like doing! 9) Why photograph the moon? Update: See our new article on how to photograph the Supermoon with some updated instructions. xattabych, no, not all the great photos out there are fake. I personally almost never edit photographs in Photoshop, unless I work with Panoramas or HDR – my workflow is 99% based out of Lightroom. For moon photography though, since the moon is so bright, you have to use two separate exposures and combine them together. There is just no other way, simply because no camera can capture that kind of a range of light. an alternative may be to hold a black postcard and shake before moon while keeping foreground exposed enough for long. somehow i managed a few shots with this trick, and got moon and foreground properly exposed in single shot. I donot use photoshop, only use lightroom. Thank you for the tip! I am a beginner in photography, and I´ve been trying to capture both moon and background, and now I know why is that not so easy to do. My Canon 6d dslr has a setting on it for HDR. Only problem is that it outputs the image in .JPG format instead of RAW. It’s also worth remembering that in the days of film we used the darkroom. Photoshop is just the digital version of that. very few professional photos are as is from the camera without some crafting in the darkroo whether it is film and chemicals or digital processing. It still requires craftsmanship. Just a question please? I am about to buy a zoom lens and I have got two options. Which one do you think more useful for beginners right now? Thank you for the feedback! Without a question, I would go for 70-300mm VR! Although it is considered to be a consumer zoom lens, even professionals use it because it is so good! I believe Nikon has a great promotion on that lens until December 12, 2009, but it might be a bundle deal. Thank you for your advice. I am going to buy the 70-300mm one. But, if you remember Mirza Holmedov, saying, “Qulupnay Bahorda Buladi…”. The same thing in the UK. “Promotions US da buladi…”. Thank you soooooooo much for this page/advice/tips ! I just had the most beautiful moody cloudy bright gorgeous full moon ever tonight ! (funny it happened just on the winter Olympic closing night) and it was perfect and I finally had the right cam to capture it ! just a quick question, i took a picture of a moon with a 300m lens for the 1st time with a tripod n got a double image of the moon. one clear short of the moon n next to it the glow of the moon. is this due to the slow s/speed as i used F/11 at 2sec and only noted that i shld be using 1/125 (i’m using the canon Rebel XSI). great info though. cheers! Terry, what kind of 300mm lens are you using? If you are using a fixed 300mm lens, you could add a 1.4x or 2.0x teleconverter to get more reach, which would make a huge difference for moon photography. You are most welcome! Let me know if you have any other questions. Thank you Nasim. This is exactly the sort of info I was looking for. :-) It is much appreciated that you take the time to do these write ups. Many thanks indeed for your interesting article. It is pretty technical to capture amoon shot as you mentioned. Your shutter settings and aperture are very useful advice. Philip, you are most welcome! Please let me know if you have any other questions. Philip, you are most welcome! Thank you for your feedback, I appreciate it. I am also interested on moon photography. Surfin on the net I found more sites like this one. However the one I am sending the link is really special for moon photo lovers. PNSC, wow, that’s a very interesting concept – I will definitely give it a try! Thanks for the link! Why aren’t you happy with your D300? My D300 seams not to work very well in low light conditions. many times i try different ways in those conditions and the pictures noise is huge. On top of that using the automatic 51 focus points the pictures are not focused in all scenes. I also tried to change the lenses but still the same result. One way I found to reduce that efect was changing the setup to central point focus. Improuve a little but not perfect. Maybe because I dont know how to handle properly all the options of the camera, so many time I end up using a small pocket camera that assures me nice pictures almost all times that I have to work in the field picturing rocks (I am Geologist). On D300 even the aautomatic mode doesnt look like completely automatic. I am an amatuer fotographer. I think you need to learn your camera…it should yield much better results than a point and shoot. I have a nikon D300. I am a beginner I thought i wouldn’t like my camera but I started to learn anything about photography. I tried and tried until i get the perfect shots and i like it i also have 6 different lenses and it’s fun but i need to learn more. It’s not about how cheap your camera is, but it’s about your knowledge. Thank you so much Sir Nasim for your advices it’s very helpful for us all beginners. John, what is your shutter speed, ISO and aperture? How stable is your tripod and how are you triggering the camera? Nathan, looks like you had a successful shot, congratulations! Nice to meet you too Teng! I had my D200 Nikon Camera for quite a few years now. The most of all I’ve always love to shoot the moon which is my huge hobby. I’ve also took the moon before it gets dark like around before 6 PM. It came out great and for tonight I totally forgot what iso and shutter speed the f/stop too. Thankfully, I had my message on my blackberry to save my setting menu. Sure enough I took quite a few shots. Will do the photoshop tomorrow and put it on my face book. I dont even see anything wrong with the D200 camera at all. I had the lens with 400mm plus was using my handheld with high shutter speed. If things are not working like it suppose to then I will do another one with tripod. Diane, the Nikon D200 is a great camera, I am glad you are enjoying the results from it! Pradipta, that’s a neat shot of the moon! I really like how it came out with all the textures, nice job! I like your Moon shots. How do you take a picture of the Moon and Venus, when they are close together. I was told that I would have to buy a more expensive lens for my Nikon D3000 to take lunar photos. I have tried, and failed miserably, taking pictures of the moon, they turn out blurry. The lens I am using is the 55-200. Because of your answer to someone else, I am going to try it again. Fingers crossed for, at least, a good picture. In deed a great technical tip. I have canon 550d and 18-55m kit lens. What kind of shooting mode, aperture (with focal length), shutter speed and ISO do you recommend? thank you. I found your site tonight as I was trying to capture a couple of clear, crisp pictures of the moon tonight. Your tips were a tremendous help. Thank you again. Incredible article!! Everything I need to know to photograph that moon.. Thank you sir for your wonderful info. I was looking in a astrophotography book on how to take moon pics but was unable to find anything about iso and f-stops values. The only useful info I got from the book was about mirror lock. Last night was a full moon and I got some pretty nice pics using a canon kiss x2 (d450) with a ef 55 – 200 4.5 – 5.6 usm II lens. Thanks for your help on shooting the moon. It was very helpful. appreciate all your tips..heading to wyoming to capture the full moon july 16th..hoping for a nice shoot…I have a nikon D3000 with dx AF-s 55-200mm 1.4-5.6g lense. been practicing on the half moon and worried about the brightness of full moon ..right now my setting is at manual 1/40 Iso 200 with tripod. it’s not too bad…what should I try my setting at with a full moon and tetons in the background? thanks for your time. oh,..my goal is to capture the moon just rising on the tetons so when I crop and zoom the picture I will have both mountain and moon in crop picture.. I am using Canon 500D with Tamron 18-270 Lense. I used the same settings as you have mentioned in this post ( ISO 100, Aperture f/11, Shutter Speed 1/125). The picture I have taken they are pretty good when I view them on computer. As the moon look very small I try to zoom in or corp the image but I can see that moon is actually blurred. How to resolve this. try it out, works great with a nikon 1972 300mm 4.5 and D300 Camera. Marc, the image you posted cannot be opened, because only your contacts in Facebook are allowed to see it. You would have to share it through Flickr or other services. I have a Canon 60D, EFS 18-200mm. I wish to capture the moon, any particular suggestions/tips? Just wanted to say thanks for the tip, had been struggling with my Canon 600D until I came across your site. Thanks so much for your expertise!! The full moon tonight should be beautiful. I am going to attempt some shots of the eclipse in the morning. It will be taking place around 5:30 a.m. here. I don’t really know what to expect. I know the brightness of the moon will probably decrease rapidly when the eclipse starts. Do you think their will have to be extreme changes made in the typical settings? Finding a place to have both horizons with an unobstructed view seems to be my greatest challenge :/ I hope you are going to photo the eclipse so we can see some good shots of it! Why on Nikon i should have the ISO 200 and on Cannon ISO 100?! Thankyou Nasim Munrov for all your gr8 literature here it helped me a lot! Well I want to ask you That I got Nikon D5100 and iam going to Buy a Nikkor AF-S 70-300mm lens and want to photograph the Moon well a teleconvertor would be necessary to use? And if yes then recommend me the one teleconvertor to use for bird photography! Sorry for that misSpell your Name Nasim! You have posted a great read! I will take it to heart. I want to know how to photograph “Star Trails” I went out saturday night, it was about 20 degrees and the night sky was clear. All I got in the shot was a pink picture. I think there was too much light pollution in where I was at but planning on going to a rural area next. According to many posts I was to use a 30 sec shutter speed. Im wondering if it would work better to not have my lens at 300x? I tried your recipe above . . .marvellous ! It worked to a tee ! Thank you !! We had 2 days of beautiful moonlight here in NY. I switched my lens to an older manual 50mm 1.2 AI-S on my D300. Setting the aperture to f/16 gave a beautiful “star” just as it would with the sun on a bright day. Thanks for your tips ! You are most welcome Mahan! Thanks so much for your information. I have a Nikon D7000 and I am attempting to bracket exposures as you suggest. I am able to bracket + or – several increments….what do you suggest? Maybe +1 and -1? I will be using Nikon 70-400 zoom. Ken, yes, +1 and -1 should work well for bracketing! Nice, thank you so much for your information. It helps me a lot. Hi, it was really really helpful!Thank you so much.I needed some advice. I have Nikon D5100 and 55-300mm AF-S DX Nikkor lens. – I am eyeing Tamron 2x SP Teleconverter.Is it good?Also, do you recommend using a teleconverter or a dedicated telescope for moon photography?P.S. that I am a hobbyist. – Lastly, if I am using a teleconverter which affects the aperture by 2 stops, what aperture would you recommend? Thank you.Once again a very helpful post sir. Thanks for the useful tips and keep them coming! Nasim, don’t know if you will see this since such an old article , but specialized situation this weekend , a Supernoon . I loved the article , my problem for this shot I have not encountered before . 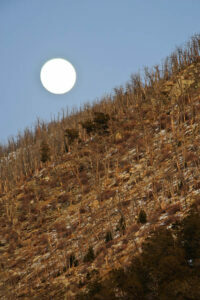 Sunset and moonrise is only one minute apart on May 5 , 2012 . The next night the moonrise (day after full moon) the rise is more than an hour after sunset . I can’t think of a way to get a good shot on the ”official” full moon in those relatively bright light conditions. Any ideas ? My best is to just shoot on the day after , I presume the moon size will still be above average in appearance. Or shoot the landscape shot on May 5 , and moon on 6th and superimpose . Thank you! I was very happy with the images I captured tonight thanks to your advice. wow! Great article and I wish I had read it before last Saturday for the super moon. Unfortunately, it was very cloudy in my location on Saturday at moon rise, but it cleared around d midnight and I went out with my Canon T2i and 200 mm zoom. I got pretty good pics, but after reading your article I realized I had the f stop too low (open) and the craters, while visible, are muddled. But I know better for next time. I’m also looking for tips on lightning photography. Do you have an article on that and can you point me to it, if so? 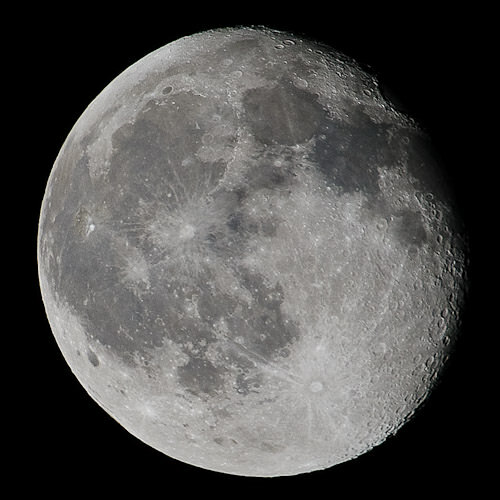 the lower right side of the moon is either too bright or not clear enough to spot the craters. What am I doing wrong? Any advice? Thanks for your article. I took some photos of the full moon on July 4th. experimented with my camera ( Nikon D5100 w/telephoto lens) at wide range of different settings just to see the results. Got a beautiful picture of the moon in it’s orange state when it first comes over the horizon. Thanks for a very informative post. I’m new to photography and am always looking for specific information to help me. This was great. I’ll be subscribing to your blog. Thanks for the tips on capturing the moon. I was getting blurry pictures before I read your post. I was going nuts. Now the picture came out pretty descent. I used a Canon Xsi. Since the maximum resolution is less, when zoomed in, the pic does not have much clarity. DO you think it will look nicer if I use a camera like t3i? This was very helpful. I have a Canon EOS 60D, but come from a manaul SLR background. I have taken many daytime photographs, but not night time. The f/stop was the only one of which I was unsure, before reading your guideline suggestions. I was able to not only take my first satisfying images of the moon, I feel they are better than average – in short I feel it’s a success worth printing and framing. The detail is amazing and there’s plenty of room to play with it in Photoshop for all kinds of things. I have a Nikon D3100. I followed the steps below, but my picture was still very blurry. Please let me know what I did wrong. Thanks so much in advance! 1. Mount your D3100 to a sturdy tripod. 2. Turn off VR (vibration reduction). 3. Zoom to full telephoto –> I’m not sure what this means? 4. Turn off ‘Noise Reduction’. 5. Set ISO to 100 (or 200). 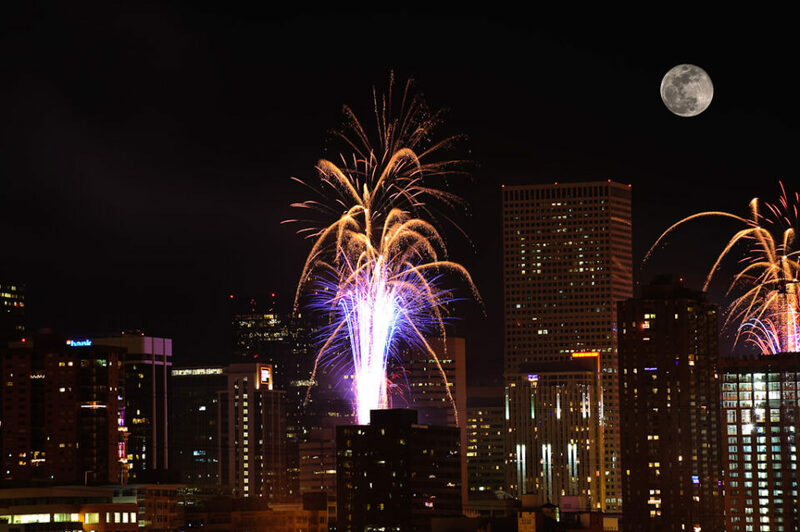 If the moon is too bright, set your shutter speed to a higher value. If the moon is too dim, set your shutter speed to a lower value. 9. Adjust your metering mode to ‘Spot’ metering. 10. Set White Balance to Cloud. 12. Set your AF mode to Single-servo AF (AF-S) –> Is this step necessary? 13. Focus on the moon, then flip the AF/MF switch on your lens to MF –> Is it really important to focus on the moon first, then flip to F? I am having the same problem. Did you ever figure out what the issue was? Thanks. In times when there was not photoshop I remember that a friend used to shoot the moon or the the sun bigger then they were: he was on a bridge zooming the next bridge with the moon in the background, closing the focal all the way (or something like that). The final result was that the spotted bridge was zoomed but the moon was disproportionately bigger, such as the moon space layer was splashed just behind the bridge. Can you confirm this? Telephoto lenses compress perspective making objects that are far away appear almost as big as those closer to you. So yes, using a long focal length lens when shooting moon would make it appear big. You think the sky is otherwise “boring”? Do you not realise what a BEAUTIFUL universe our Lord God created for us? My shots of the moon had pink/purple ring around the moon . Can you help me understand what could be the reason and what am i not doing right? Just wanted to say thanks for the tip. I use it tonight on partial lunar eclipse with my 600D. just my two cents. filming the moon when it is full, isn’t always the way to go. while you may be able to encompass the entire area of the moon, it comes at a cost. because the moon is fully illuminated, it will become harder to get the details of the crater to come through in your shot. gibbous and crescent moons allow for an array of shadow depths to hit the moon, creating more depth in the image. Hi, Very nice and informative article. thanks a lot dude. I have a question for you, is it possible to attach telescope to a camera… I heard something called O ring, using that we can do it.. but I’m not clear about how to identify the right telescope and other accessories for my camera (if at all possible. ), can u please explain me. I loved reading this article! So much good information. I’m about to try shooting the moon for the first time, and this has definitely given me a lot of information. Though I could tack on a teleconverter to the 70-200, i don’t want to lose the clarity and a couple of f stops (though wouldn’t make too big a difference if I follow the “sunny 16” rule). However, I was hoping to do some landscape photography the remainder of the time. Srikar, I would not recommend the old Nikon 80-400mm AF-D lens – it is too slow, its autofocus is terrible. Wait until I publish the review of the Nikon 80-400mm AF-S today to see what would work best for you. If you want to buy a zoom lens for landscape photography, then the Nikon 70-200mm f/2.8G VR II is the way to go (see my Nikon 70-200mm review). For wildlife, the Nikon 300mm f/4D lens is a safer bet, especially when coupled with teleconverters. Thanks Nasim! That’s helpful to know. Would I be able to get a little detail of the moon if I were to use the 70-200 mm f/2.8G VR II? Hi there,just wondering I have a canon7d and was wondering what would be the best lenses to start out in photography. Thanks! I used my lil FujiFine Pix and got some awesome pics of the super moon. I am thrilled. I had a zillion epic fails first but finally… success! By the way I am using a Nikon D90 with lens of 18-105 mm, would it be suffecient to get a quality shot with the Supermoon tomorrow? And what would you recommend best for nikon D90 telephoto lens? Thank you so much. Nasim: Thanks for your insightful and detailed ongoing tips to the photography community. Most helpful and appreciated. John O.
Hi;). Very helpfull article thanks. I just have one question: why is the ISO setting on a Nikon different to a Canon? Actually we have two moons! One of which we cannot see. Thank you for your tips – I was so disappointed when I first tried – just a white blob in the sky. Then I ran across your article – changed my settings on my Olympus E-510 with a 2.0x teleconverter on a 150mm lens and got great shots. Thank you again – isn’t it great that almost 4 years later your article is still helping newbies like me enjoy photography? Thanks for such tips… nice work.. I want to ask a thing can we capture a smaller image like a toy car look too big using ordinary digital camera ? i search but nothing found… do u have tip or solution for that. .. i am fond of it. Thank you very much for excellent article. It’s to the point and perfect. I hope to capture the moon today and upload the photo. I was not able to use the camera effectively and couldn’t understand why my photos of moon are not coming as I see it. Thank you! I hope to capture the moon to use in composites. My last attempt was a “blob of white”. I appreciate the Photoshop editing comments as well. Thanks! To whom it may concern. Well I am a beginner in the Photograhy Business but I have a lot of questions , and that is if you do not really answering them. Great post. The moon can be tricky. Great one once again i am regular visitor of your all the article Thank you much for all the special articles..!!! D5100, ISO 100,200, shutter speed 1/200 till 1/800 and f/11 to f/18… Looks like moon is brighter than yday… Thanks for reply. In paragraph 2 you have written “as in the example with a tree above” …… there is NO example on the whole page that has a tree in it. HI great article very helpful. I have one question though. If I was to combine a photo of the moon with a photo of the stars around the moon, how is that possible? In order to expose for the stars, the moon will not only be blown out, it will be flared like crazy, blocking out large areas of the photograph. The only thing I can think of doing is cheating, by taking a photo of the moon and then combining it with a photo of stars in another part of the night sky. I must thank You Nasim for superb article bcoz it works. I have tried my first shot to photograph moon basing the article as reference point. I am excited about what i got. Yes sure the shot can be further improved but then that’s just the beginning. I try the settings and i see two moons !!! I used a UV filter in my lens is that a problem ? Your directions for Nikon were right on perfect. The way you wrote it up was easy to follow. I seen videos and other pages but your page was the best. Thank you SO much for this “to the point” tutorial. Today I took several shoots at the “Super” Moon. None of them came out sharp. I was using a ball headed tripod, mirror locked up and remote control for the shooting. Also I tried with both the Noise Reduction Feature ON and OFF as I remember reading to turn it off when you are super stable not to confuse the processor and end up creating a blur. Something worth to mention is that at such a high zoom levels, the camera shake just by moving the focusing ring is unbelievable… Any tips? What was also very hard to do it was to find the spot in the focusing ring when by moving it 2 mm it would go from blur-focus-blur. Any advice? For shake, if you’re using a tripod, some cameras can use a remote control to click the shutter (my Nikon does). Amazon makes and sells one for the Nikon and I’d bet they do for various Canon’s, too. With a tripod, you’ll probably find the moon moves much quicker than you’d expect at high zooms. Thanks for this great article and tips. Worked perfectly for my Nikon. That and a little nudge from Lightroom makes for some great photos. Thank you for this great article. It was easy to follow and I now have some great photos of the moon. I would also like to thank you for a great article and a really informative website. For those new to photography, like myself, having someone explain things in such an easy to understand manner is an extremely useful resource……congratulations on a great website! I wonder if I could ask you one quick question on photographing the moon please? However, there was one point during the shoot when some clouds passed in front of the moon and made the scene look very moody which I was keen to capture, but my lack of experience let me down. I got a nice shot of the moon but the clouds were nowhere to be seen! Its as if the moon was so bright it almost burned through the clouds and left just a round image. I tried in vain to adjust the aperture / lens speed, but gave up in frustration and thought I would look into this a bit more before I try again. Perhaps try the HDR mode, if the camera has it? Is it possible to get good results in moon photography with Nikon D3200 and Tamron AF 70 – 300 mm F/4-5.6 Di LD Macro . As a beginner i found your website is an extremely useful resource. I have canon eos 1200d 55-250 mm kit lens. Is it possible to get tat kind of image using this lens or should i buy any extra kit for that. I tried taking picture of moon but couldn’t get that kind of clarity. A brief note to anyone using a tripod. It you’re using a high zoom then don’t be surprised to see the moon move out of frame fairly quickly. Also, many DSLR cameras can use an infrared remote to snap the shutter which can reduce shake. Check the ones made by Amazon. this may seem a silly or irrelevant question , do these settings apply when shooting the moon in the early mornings. when the sky’s gone that light blue colour but the moon is still very clearly visable. This article helped me out greatly!! I really appreciate you sharing your knowledge, I took an awesome shot of the moon tonight with help from reading this. Thanks for the article, but why would you say “if you know how to use the right tools in photoshop” without actually telling us what those tools are? Are they some secret? If it only took 2 minutes then it shouldn’t have been a problem to explain the main objective that most would want to take a pic of the moon for in the first place. 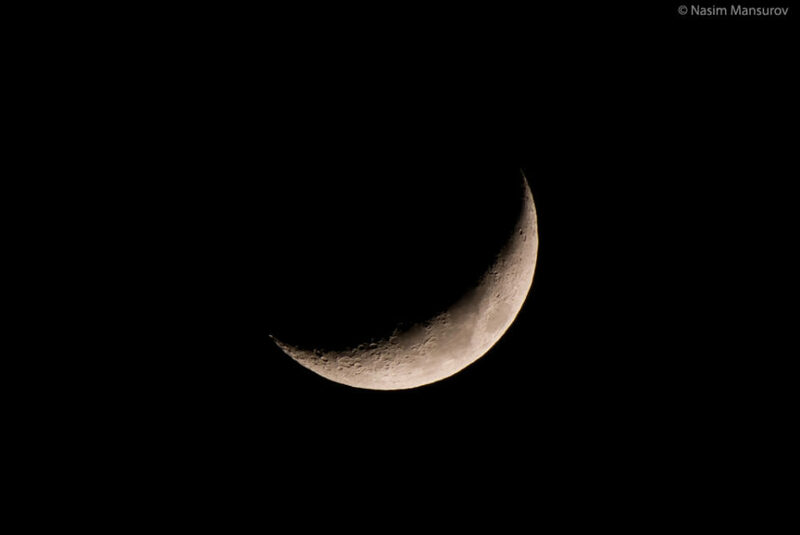 Hand held Moon Shot with the D610, Tamron SP 150-600mm, using the DX crop, VC on, 15m-infinity setting, f/6.3, 1/640s, ISO 100. The clouds played truant so couldn’t shoot the eclipse, ended up shooting the full moon instead. 04-04-2015, Night. Thanks for the article. Here is what I could do with my first attempt. Grabbed this one last night w/ Canon Rebel T3 and your recommended settings (and threw a couple PhotoShop adjustments in there to grab the details – Auto Tone and Auto Color). Thanks for the tips! Always nice to find a good article on properly photographing the moon. Just shot this one a few days ago. What I think is interesting is the improvements in highlight recovery in raw files that we have now, both in camera and in post. I like the look it’s giving me to show more of a moody and mysterious moon image. This could be a good option to add as background to a fashion-type photo. I really like your blog here. It has a nice, clean layout without the clutter of so many, and good useful articles to help me cut through all the noise out there. So done with Facebook and other social media postings (which only link me to a website anyway). Blogs and websites are the way to go. Thanks Nasim! *Thank you! * thanks to your instructions, I was able to photograph the moon! I’m about to buy the Nikon D810. I have a couple of questions. Should I op up to the 810a made just for 8ght sky shooting and will it give me the same portrait and landscape shots I want for day and light situations. Also I’ve set a 6000 dollar budget. What 2 or possibly in a package 3 lens do you recommend ? I want to shoot lots of portrait settings along with weddings etc some sports not as much as still. Could you please give advice how to photograph the blood moon? With the normal moon instructions I got a black photo as the blood moon is much darker. Thanks for the tips. I should have checked this post before I went out for shooting tonight. One, I note the 1.25x teleconverter only work with the 800mm lens, so I am too smart and want to mount that on the lens with another 1.4x iii behind it in anticipation to yield 1400mm f10, but obvious I miss the point teleconverters could not be stacked! So finally I only managed to get to 1120 f8. Two, you are right, the moon movie darn fast (I used lcd to focus but constantly found the moon dropping on the side, initially I blamed the gimbal not locking in), I use wrong setting of 1/8 sec, f45 iso 800, the result was soft. Also even sturdy tripod applied, I should not do it on a windy night. I’m not enthused that a real photographer would so cavalierly advice indiscriminant use of combining images of the moon into other shots, for reasons beyond the ‘ethical’. First, moon phases are not arbitrary; a full moon is always directly opposite the sun, so the sun, its implied rays of illumination, along with cast shadows, are all going to be directly from behind you if the moon is low and in the photo. Nothing shouts “fake” more than a mid-day high angle bright sun shot with a full moon neatly sitting behind the subject. 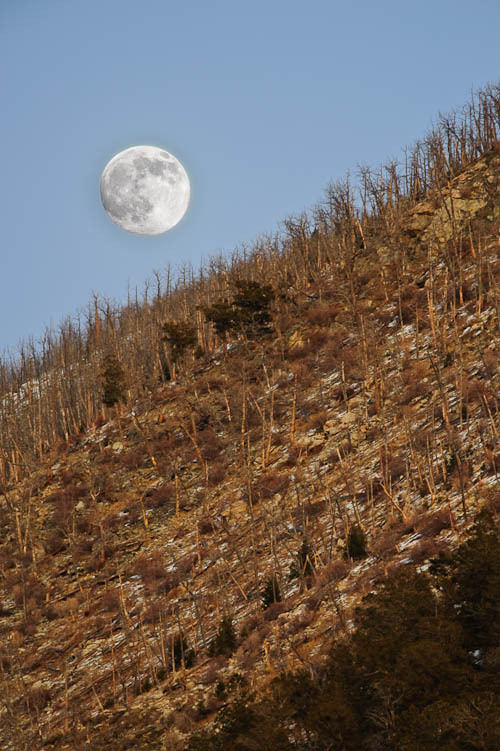 Near-full moons can be a bit above a horizon with early or late daylight, but never is a naturally lit scene able to contain both full midday sunlight and a full moon. Another tipoff is cast shadows running contrary to the true angle from which the sun’s light must be coming in relationship to the moon phase. Awesome The article helped tons. And why photograph the moon ? We;; if you ;earn to shoot well in the dark Bright to dark.Dark to light . Anyone can point a camera in the daylight. But the dark especially telephotography now thats an art. Thank you tons for the starting settings and other encouraging Advice. As long as we’re going to cut and paste the moon into other shots, why not shorten the article? I am not sure why my faster shutter approach failed, either the F stop was too open, or my ISO of 800 was too noisy perhaps. Thank! I know people calling for 200+ mm lens for moon ..but last night i captured moon photographs with my 18-105mm lens. The only thing is it’s small in size but if you do everything right than photo will be crisp and you can zoom in and crop it ,it will be a good one not what higher zoom lens can capture but you can always try just to have a feel of it. Thank you for the information. I was trying to photograph the Supermoon tonight and could not get it right (it was just a bright dot because I was overexposing it). I used your suggestions and the pics came out great. Very helpful article. keep it up! Thanks! Hi there, your site is amazing. I have a eos600d, and after reading this all day was excited with the super moon tonight. Unfortunately we have clouds everywhere. I’ve set ISO100, F11, & 1/125, but everything is black. Is this because of the clouds, and there’s not enough light from the moon? What macro lens would you recommend? Canon eos100d. Want detailed pictures of coins and pretty small insects…. Thanks for the post-processing tips. Love that Unsharpen Mask trick. One of the all-time astro-photography secrets. Now, I’m truly a professional. Just wanted to thank you for your help – just shot my first successful moon shots! I’ve just got my first camera for Christmas it’s a Canon eos 100D and its great to have this information as I too want to photograph the moon . Although I’ve only got the 18-55mm lens I will be heading out to get the 70-300mm. I find all this information very very useful many thanks . I just took a great photo of a half-moon following these instructions. Thanks! Hi Nasim, thanks a lot for the useful information on photographing the moon. I was wondering if you could help explain a bit on the photoshop piece (I’m referring to the two photos, one with foreground properly exposed and one with the moon). How did you combine the two photos? I tried using merging with HDR, but the results didn’t come out well. Because the moon had already moved quite a bit by the time I took the second photo. Thanks in advance! I tried to take picture of the name using the sitting you gave us, but all I got was black screen. So the only way I was able to capture the moon was using 1600 or 3200 iso and not 100. So why did you say we can use 100? I’ve just stumbled across this excellent article and found it especially useful as someone learning about photography. The before and after photos of the Moon once I’d used Nasim’s words of wisdom are hugely improved – many thanks! Hello. I’ve read this article, as well as several others and have found it very interesting and informative. Do you have any tips or advice for taking interval shots of the moonrise? Specifically with respect to ISO. Obviously my aim is to stack the images in Affinity photo to get one image but as the shots would be taken over an hour or longer, I’m a bit concerned about whether Affinity photo would take an average colour of the darkening sky and have that in the final image, or keep the sky light/dark in the final photo. Does that make sense? Any help would be appreciated. i am beginner and i loved it when i see moon. I’m trying to photograph the pink moon as it rises over the lake in my area this week, must of my pictures are not what I am wanting. Thanks for the advice and explaining photo shop. I have question about the foreground shoot. Should this be done before dark or just with a smaller wide lens ? Trying to capture the houses and trees on the shore line with the moon rising over the water. You may already have been asked, but I skipped forward in time… I have a Canon 5D and a Mk 2 70-200 IS f2.8 L lens as well as a 1.4/2 x converter (Canon). I note your comments about tele-converters – do you think the Canon own-brand converters would be OK? I can find out for myself, of course, but not just at this moment – more importantly, if I am putting the camera on a tripod, locking up the mirror and using a remote release, then is it better to switch off the stabilization? Check out the Android app “Moon Locator”, that helps you predicting the location of the moon using an Augmented Reality view. Very useful for planning your photography shoot. I used a Nikon D7500 with AF-S Nikkor 80-400mm f/4.5-5.6G ED VR lens attached to a tripod but although in my view finder it looked amazing when I took the shot I only had a black image :( What am I doing wrong?